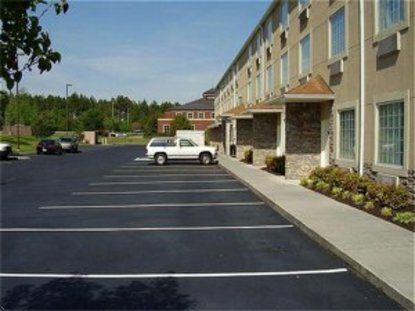 The Holiday Inn Express Hotel & Suites The Holiday Inn Express Hotel & Suites is located in Alcoa at the Knoxville Airport off Alcoa Highway. We have 80 beautifully renovated guest rooms which include business and Jacuzzi suites. Enjoy our new Stay Smart beds with soft quilted duvet, fresh white linen with the feel of Egyptian cotton. A colorful new throw with your choice of soft or firm pillows. Free wireless high-speed if you did not bring bring you laptop, please use our business center with free Internet and printing. All rooms offer hair dryers, irons, ironing boards, coffee makers and new 27" televisions with over 40 channels to surf and free HBO. As always a hot deluxe complimentary breakfast is served each morning from 6:30 AM to 9:30 AM Monday- Friday and open on weekends till 10 AM so you can sleep late and enjoy your stay. We offer an indoor pool with a outdoor veranda for summer time fun in the sun. Our new health and fitness center is located on the first floor for your convenience. We have 2 large meeting rooms for your next event, family gatherings or business functions. This hotel is committed to providing accessible facilities under the American Disabilities Act. If your accessibility needs are not met, please contact the Hotel Manager on Duty. Should you require additional information regarding accessible facilities for guests with disabilities, please call 1-800-Holiday (U.S. and Canada) or contact the hotel directly. For the hearing impaired, TDD service is available at 1-800-238-5544 within the U.S. and Canada.